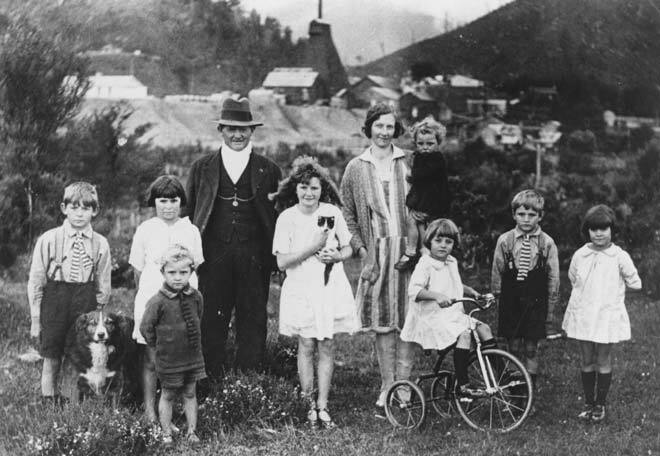 Miner Percy Jones is pictured here with his wife Mona and children at Waiuta on the West Coast. Percy was forced to quit underground work as he developed silicosis (caused by inhaling quartz dust and also known as phthisis). To support his large family, he became a shopkeeper selling fruit, vegetables and confectionery. Cases such as his led to the Miners’ Phthisis Act, passed in 1915, which provided pensions to miners with silicosis and financial compensation for widows and children of miners who died from the disease.